The Ohio Fall Production Sale is tomorrow – October 18, 2014 at 11:00 a.m. in Wooster, Ohio at the Wayne County Fairgrounds. The Catalog is ONLINE for you to view, download and print. Also, take a look at the FLY SHEETS for the sale. There are about 33 cows in the milking herd at the Ohio Fall Production Sale. Click on the picture to see the VIDEO of the COWS. Around 70 bred heifers are in Wooster, Ohio. 45 of them are third trimester heifers, due December or sooner. The VIDEO of the bred heifer pen can be found by clicking HERE! Grammer Jersey Farm is selling 3 pen lots of 5 Springers. Take a look at each “pen” in this VIDEO! Open heifers are available, down to the youngest member with an August, 2014 birthdate. Take a look at them HERE! OAKHAVEN LEGAL MAID, VG-82% is selling as Lot 113. She is due with a Heartland Merchant Topeka calf in mid-November and ranks on the Top 1.5% GJPI Cow list in (10/2014). Click on the picture to see her in action. Our lone “Stud” bull this year, Lot 131 is GRAZELAND PLUS KRYSTOFF. He has a GJPI of 188 and has a full sister who is on the Top 1.5% GJPI Cow List (10/2014) and was just raised to Excellent-90%. Type and Production are part of his pedigree. A short VIDEO can be found of him by clicking on the picture. Any member of the sale staff would be happy to talk to you about the cattle you are interested in buying and/or handling your bids in confidence! The Western National Catalog is now online! The Western National Sale will be held directly following the Futurity class on Friday evening, held in conjunction with the Western National Jersey Show. The sale will be broadcast LIVE on Jersey Auction Live. Bid from anywhere online with this service. Log on at sale time to watch the sale and bid…LIVE! JMS is currently accepting consignments and making arrangements for an exciting Fall Sale Season, starting in South Carolina on August 31 and currently finishing at the All American Sale, November 10, in Kentucky. Sales are continually being added to the schedule though, so please continue to check out our JMS Sale Calendar for updates! The DIXIE INVITATIONAL CATALOG is now online! The Dixie Invitational is the current start to our Fall Sale Season on August 31, 2013. Bush River Jerseys, Newberry, SC have graciously offered to host the Dixie this year, even though we will not be having a Bush River / Treasure Chest Combination Sale in 2013. Contact Brad Barham, (614-600-8416) your AJCA/NAJ Area Rep for more information. The JMS staff will then move to the west coast for the Western National Sale at the Washington State Fairgrounds in Puyallup, WA. Watch for more information on the great consignments to be offered at this year’s sale! Contact Flint Richards, (614-266-9921) AJCA/NAJ Area Rep., or Pat Gourley, (503-334-7406) Sale Chair for more information. The Bill Grammer Family will be reducing some of their Jersey inventory on September 14, 2013. Grammer Jerseys and some guest consignors will have young heifers to young cows selling in this “Summer End” Sale. Join us at Grammer Jersey Farm in Sebring, OH! The Vermont State Sale is on a new date this year! While still hosted at the North Haverhill Fairgrounds, North Haverhill, NH, the State Sale will be held on SATURDAY, SEPTEMBER 21. JMS will be managing this sale and we are accepting consignments NOW! Please contact your AJCA/NAJ Area Representative, Brenda Snow (802-249-2659) or JMS (614-322-4473) to add your heifers to this yearly event. The deadline for catalogs is August 23, 2013. The New York Fall Sale will be held in Norwich, NY at the Chenango County Fairgrounds, a new venue we worked with for the spring sale. Please get your quality consignments into the office for cataloging by AUGUST 23! We are looking for a gathering of quality type and production Jerseys to sell in this annual fall sale. Please contact your AJCA/NAJ Area Representative, Sara Barlass (614-256-6502) or JMS (614-322-4473). A week of dairy greatness begins in Madison, WI at the World Dairy Expo, October 1-5, 2013. Between the heifer show on opening day and the cow show the following morning, Jersey enthusiasts flock to the sale pavilion for the Top of the World Jersey Sale. On October 1, 7:00 p.m. (CDT), we will sell a great selection of show quality, genomic potential and pedigree building consignments from our breeders. The deadline for having your awesome consignment considered for the Top of the World catalog will be August 23. Please contact JMS staff or your AJCA/NAJ Area Rep to consign. To add to the week of great cattle in Wisconsin, JMS hosts the Dairyland Protein Sale in Janesville, WI on October 3, 2013. This year’s event will be featuring a sizable quality group from the All-Lynn herd. Type and production combinations are the focus of this sale, and we welcome your quality consignments up to August 23 for catalog and advertising deadlines. Your AJCA/NAJ Area Rep., Kristin Paul (209-402-5679), would be happy to help you. The Ohio Fall Production Sale will be held at the Wayne County Fairgrounds in Wooster, OH on Saturday, October 19, 2013 at 11:00 (EST). Please submit your quality consignments into the office for cataloging by SEPTEMBER 13! We are looking for a gathering of quality type and production Jerseys to sell in this annual fall sale. Young cows and bred heifers have sold well at this sale, with a nice addition of breeding age heifers. Please contact your AJCA/NAJ Area Representative, Greg Lavan (614-216-8838) or JMS (614-322-4473) to consign or for more information. One of the largest Jersey events of the year is the celebration of the little brown cow in Louisville, KY during the All American festivities. During that week, JMS hosts two events, the Pot O’Gold Sale and the All American Sale. The Pot O’Gold Sale, presented by Cow’s Match, will be held the evening of November 9 and is an all genomic tested offering of great production and deep pedigree based cow families. This sale is for current and future Junior breeder participation only! In addition to gaining a great start to a young herd, all purchases in the Pot O’Gold are entered into a production contest against all the consignments for that year. Since its inception in 1958, the sale has offered youth (ages 7-20) the opportunity to purchase genetically superior heifers from top herds across the country. A percentage of the sale gross is set aside in a fund and held for three years to provide cash awards for the junior breeders whose heifers complete the highest records for dollar value. The 2012 Pot O’Gold Production Winner was Michael Kortus, WA with Kilgus Finalist Gem-ET. His cash prize was $2,408.22. The All American Sale offers an outstanding selection of Jersey greatness, from breed-leading genetics to show-quality pedigrees, from top herds from around the country. AI organizations watch this sale with great anticipation, as do a great many breeders and other Jersey enthusiasts. This is the Jersey breed’s most elite showcase of Jersey Genetics and will be held on November 10! Both sales are currently accepting consignments. To nominate an animal for either sale, please contact Jersey Marketing Service at 614-322-4473, Sale Chairman, Pat Gourley (503-334-7406), Associate Sale Chairman, Eddie Kirchdoerfer (573-334-3769), or your AJCA/NAJ Area Representative . Genomic evaluations for heifers in the Pot O’Gold Sale MUST be in the lab by September 6 for the absolute latest consideration of your consignment to the catalog. The AJCA Board has appropriated funds to 3K genotype up to three prospects from every owner consigning an animal to the Pot O’Gold Sale, provide one of the considered heifers is cataloged. Both sale catalog deadlines are September 6. A Top Selection of extraordinary females of superior quality, from today’s most exciting flushes, embryo packages, high genomics, deep pedigrees and cow families, and show prospects for next year all will be offered. No listing fee will be charged for this Spectacular event! Contact Jersey Marketing Service or your AJCA-NAJ Area Representative to consign. We will accept consignments up to January 4, 2014. MORE SALES ARE IN THE STAGES OF BEING SCHEDULED! Continue to check our JMS calendar as the year progresses! The 56th National Heifer Sale was held in Amarillo, TX as the conclusion of the AJCA National Convention activities, hosted by the High Plains Jersey Group. A fun – very warm time was had during the week, but the sale was held in the comfortable Air Conditioned Civic Center! A first time for JMS and Jersey Auction Live – the sale was held by video on the Live bidding program. And in the grand fashion of our host state, the sale was bigger and better this year with the sale average on 50 lots at $6362 – the highest in the sale history! Top Selling heifer was Lot 29 – a super, high genomic, polled heifer from Norm Martin and Family, Tillamook, OR sold for $26,000 to Matt Steiner, OH (online bidder). 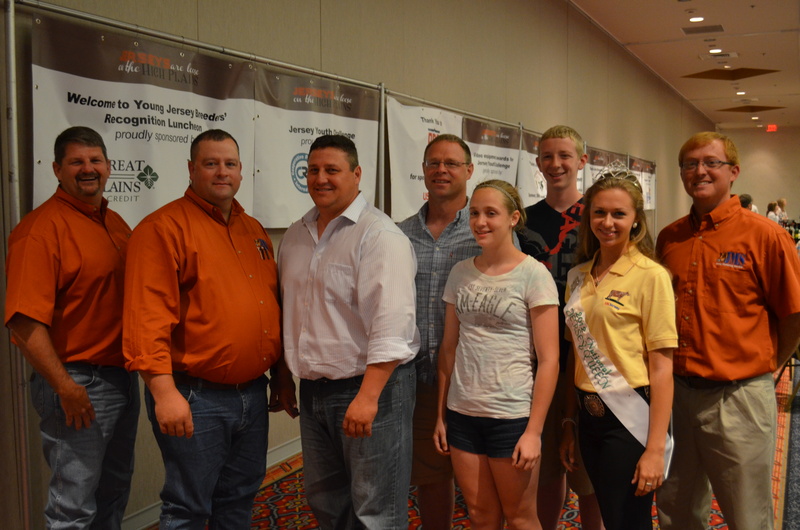 Check a future Jersey Journal for the full wrap up of the convention and the National Heifer Sale!